PostHealing is an online community that encourages survivors of sexual, child, and domestic violence to heal through making and sharing art. Taking the lead from PostSecret, PostHealing encourages the anonymous sharing of stories and experiences through multimedia in the hopes that art will help the creator heal ‘post’-violence, inspire others in similar situations to seek safety and reach healing, and educate victims and non-victims about the personal effects of the global problem of violence against women and girls. PostHealing is a creative project started by Girl Museum in participating with and celebration of One Billion Rising, a global movement to end sexual violence. Begun in 2013, the project underwent a strategic change of focus in 2018 to become more inclusive of various media types, gender identities, and modern social movements such as #metoo. Violence is everywhere and affects everyone, irrespective of gender, race, wealth, education, and other socio-economic factors. One reason this terrible cycle continues and is so hard to break is because it is often shrouded in silence and invisibility. PostHealing aims to offer a safe, creative, educational space for people to express their experiences, encouraging healing, recognition, and realization. Anyone who has experienced or is currently experiencing sexual, gender, child, or domestic violence. Participation is entirely voluntary and anonymous, with multiple avenues for participants to submit their stories. Though Girl Museum focuses on ‘girls’ (females under the age of 21), we invite people of all gender and sexual identities to contribute art and find healing through our community. Visit our Tumblr blog and click on the “Submit” button. Email your piece to posthealing@girlmuseum.org. 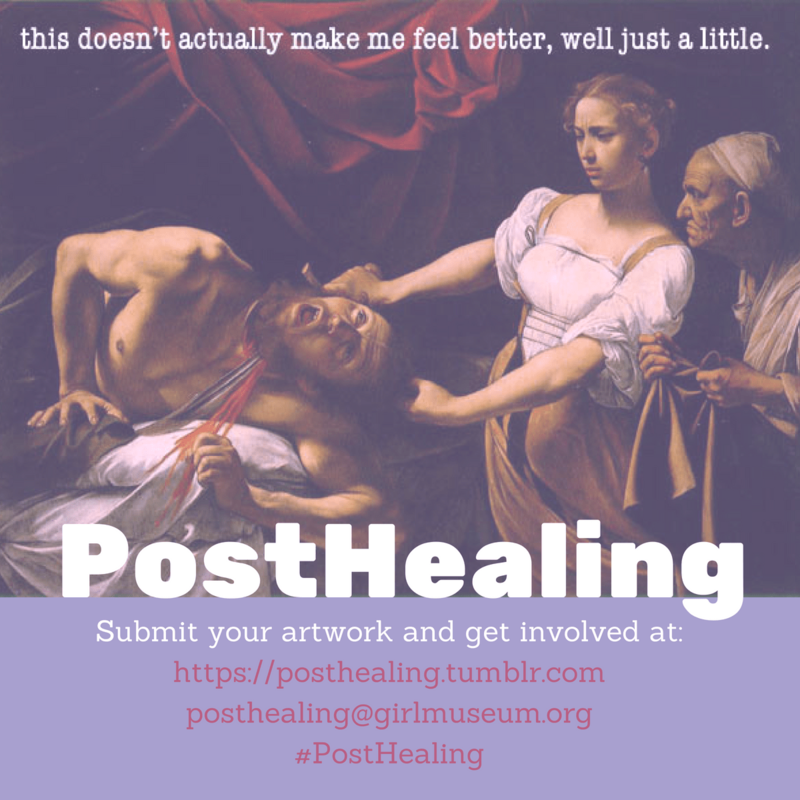 Post your piece on your Tumblr blog with the hashtag #posthealing and we will repost it to our Tumblr. You can also post on other social media channels and we will gather and repost your piece to our blog. Content for PostHealing is monitored by our team members. We respect all contributors’ right of and need for privacy and anonymity. This forum is aimed at an audience of diverse gender, age, and experience. As such, content displaying extreme profanity, hate, prejudice, or other defamatory/derogatory content, etc. will not be displayed. Our team seeks to keep the PostHealing space safe and accessible, and has the right to deny reposting of content that we find displays content harmful to those healing from violence.